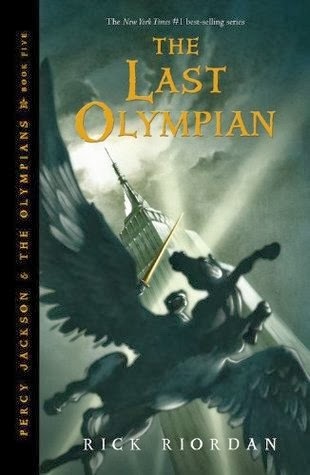 The Last Olympian is an amazing end to an amazing series. I have loved these five books. I have loved reading from Percy's point of view. As I really adore him. He's amazing. Sigh. And I have loved all the characters so much. Annabeth. She's the best. Grover. He's awesome. And Tyson. He is just too adorable. This book starts a whole year after the last one. Which made me a little bit depressed. But then everything started happening and I didn't mind at all anymore. Percy is almost sixteen, when the prophecy is supposed to happen. Which was beyond exciting, to be honest. There is so much happening. So many people die. Which was sad. Yet done really well. Enjoyed reading all of it. We see a lot more of the gods in this book. Which I loved. As I think Poseidon is all kinds of awesome. Though I must admit that I think my favorite of them all was Hades. He's just too cool. Pff. Well, he's evil. Which I loved. And his son, Nico. Sigh. He's just even more amazing in this book and I adore him so much. Just wishing I read wrong when I peeked at an upcoming book. Hmm. Still. I'm really hoping to see more of Nico in the next books, as he is the best. So sweet and young and kind and so powerful. There is a big battle in this book. And it is awesome. I loved reading it so much. Though.. yeah. So many people die. Which was heartbreaking, but I loved it all the same. I do love reading about monsters. And Kronos. Shudders. He's evil. And I loved reading about him. I still don't like Luke. I really don't. But I'm glad that story ends, as in I finally understood it better. Kind of. Probably not. But I'm ending up being okay with it. For the most part. But anyway. So many evil characters in this book. There's nothing like binge reading a great series just like you've done! I'm really glad to hear you've loved the Percy Jackson series so much! Reading your reviews has made me want to re-read the whole series again!